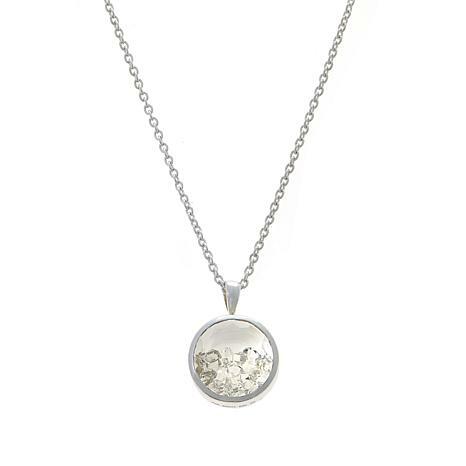 Shake up your accessories collection with this unique Herkimer "diamond" quartz pendant. It features a loose cluster of 40 natural Herkimer crystals encased behind a clear crystal window. It comes with a pretty cable-link chain so it's ready to wear right out of the box! Really beautiful. Better than expected. Love, love, love it. Im thinking about buying another as a Mothers Day gift. I enjoy all of Deb Guyot's Herkimer jewelry and this piece is no exception. It is eye-catching and never fails to elicit a positive comment from all who see it. Her style of jewelry design is very unique and I love wearing all the different items I have purchased. Love this necklace! I ordered the square one and have received so many compliments on it. 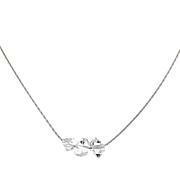 Not only is it a beautiful necklace, but you enjoy moving it around and feeling the "baby herks" move! 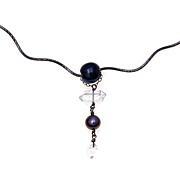 If you have been thinking about purchasing this necklace, don't hesitate. Even prettier in person.